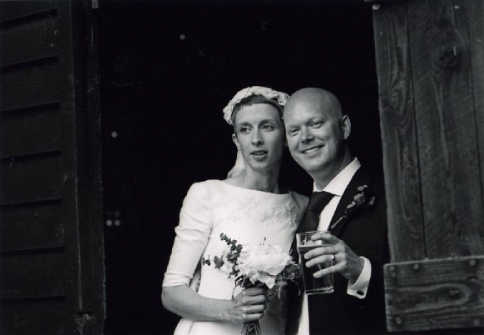 Tara had a beautiful Church ceremony in Surrey, with relaxed reception at a nearby farm where she kept her horse, in a really old barn that’s mentioned in the Doomsday book! Guests were engrossed with hog roast, vintage ice cream van, speeches from the back of a horse cart. We wanted the day to be relaxed and informal, a day all about celebrating with our friends and close family. Bridesmaids in either Ivory or Black (they were allowed to choose). Homemade bouquet was White Peonies & Freesias, with Eucalyptus, and button holes/corsages were Plum Cala Lilies, with more Eucalyptus. The barn was decorated with Cow Parsley, Foxgloves and various foliage, found on the farm land. Tara’s dress was 60’s inspired, timeless, clean, elegant, made from Silk/Linen with vintage lace applique details. Beautifully designed vintage head dress with silk voile waterfall veil. I had so much fun designing my dress and seeing Lisa turn it into a reality. Having my wedding dress made especially for me was definitely the best decision. 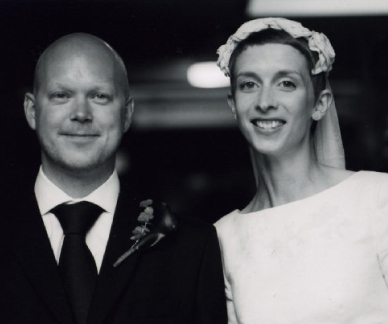 I received so many compliments on the day, but I still receive compliments even now from friends who remember our wedding day fondly, and particularly loved my timeless, classic and understated dress – it was exactly what I wanted and I still love it!